I was living in Michigan, about ten years after undergrad without any real notion of what I wanted in my art practice or how to go about attaining those goals, I just knew it was time to leave my home state and find something new. At the time, in Michigan, I was working with a loose group of peers collaboratively putting together pop-up art shows, noise music events as well as performing in a local puppetry theater. I was searching for my group, my people, but I missed working on my own art and it had been a long time since I asked myself what I needed to make. One day, I moved. After about a year living in Portland, and six months unemployed, I applied to the AC+D program one day, quickly got rejected and then, months after I applied, was asked if I would reconsider attending the program. I had finally found work painting apartment complexes that summer, but after reconsidering the offer, I quit that job and joined the first class of the AC+D program in 2009. I was interested AC+D because it was not defined in any clear or concrete terms. I couldn’t get a straight answer about what the program was and somehow that was intriguing to me at the time. It was an opportunity to make it my own and that approach seemed the most welcome as a member of the initiating class. We did just that. It was nuts, it was an incredible amount of hard work to build something from nothing, literally starting with a massive empty warehouse, but we did it, slowly. I didn’t have the vocabulary at the time but another intriguing aspect of the program was its nebulous notion of things. It did not ascribe to a hierarchy of objects. Art claimed nothing. Neither craft nor design did for that matter really either that first year. We were a group of misfits who were excited to start the conversation over from scratch. A lot of bad things were made that first year! Important things! The first striking thing about the program was in comprehending the amount of infrastructure that is required when starting a project from nothing. Not only in architecture and facilities but as well as in rhetoric and ideology. The creative practices of my peers and I had little in common with each other than we were gluttons for punishment with propensities towards blue-collar labor. Doing that work made me appreciate everything it takes to start something new, something without precedent, or at the very least, a program specifically designed not to align itself with preconditioned limitations, allowing the students to openly experiment. The program was created by and through the student’s individual needs and interests. The exceptional vulnerability on behalf of both college’s during the programs conception, shows great strength and belief in the faculty and the students involved during in the first year. The very core of the program incorporated the design thinking process we students were learning for our own practices. At times a hardship, trying to build and define the program as well as our own creative pursuits at the same time, the ACD program taught me to define my own value systems and approaches for making, thinking and distributing the work I needed to make. The ACD program extremely expanded my notion of things. I went there, well beyond my small world of stuff, well beyond my comfort zone; and it took me a long time to get back after graduation. My practicum has drastically altered how I relate to objects, in making and conception. 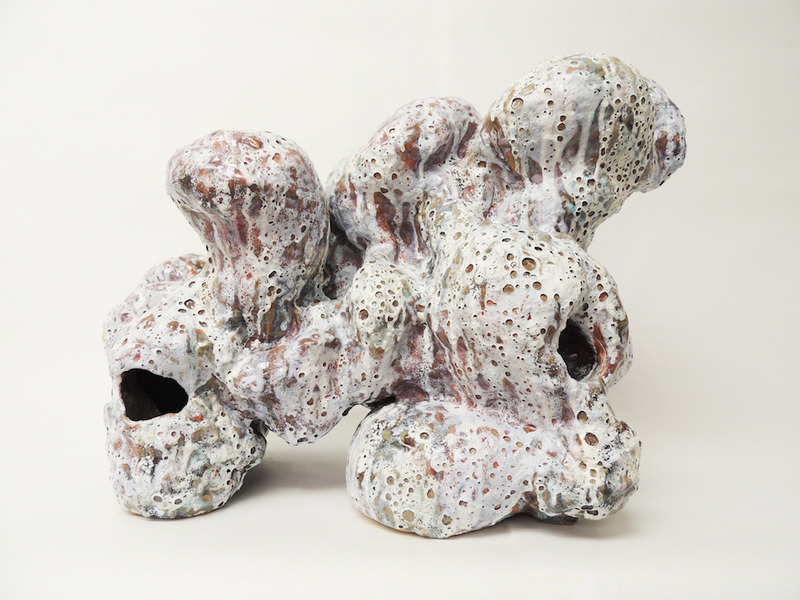 In the beginning of my MFA education my art practice was based on the object, solid ceramic things I could mold in my hands; my notion of the world was concrete but felt off kilter in a way I had not yet understood. That led to a deep investigation and understanding of material consciousness. Material as form, material as concept. During the final semester of my Practicum, both material and objects came to be defined by space, both physically and virtually. Now-a-days, some eight years after graduation, my approach to ceramic sculpture is based on what I opened my mind up to for my Practicum. The shape of space is defined by the boundaries I set in clay. Due to the process of ceramics, it always has to be hollow. In my earlier ceramic career that was always an afterthought, a necessity for firing clay works in the kiln. Now, space is the driving intention for making a form around. The Practicum has helped me look at my art practice from a different and often opposite vantage point. I’m standing on the other side of the expansive valley of things now. Craft and Design Thinking support my art practice both in technique as well as intention. I make for myself as well as the viewer now. Currently I live in Philadelphia, PA. I’ve been here since 2014. I am a full time artist-in-residence at The Clay Studio; a five-year gig. I am employed as the Ceramic Supervisor and Technician in the Materials and Craft Studies Program at the University of the Arts. As an instructor, I teach part time at both institutions as well. Next summer I will be researching my interest in Geomythology while traveling in Iceland for two months thanks to a generous grant from the Independence Grant Foundation and a residency at The NES Foundation. Be selfish. Do what you want, make the program your own, yer paying a lot of money and spending a lot of time. Allow yourself the freedom to fail. At first, create without precedent or limitation. Make a lot; fill the dumpster! Read a lot; fill your head. Write a lot; exhaust all your seemingly amazing ideas. Try a different medium. Learn a new skill; take an undergraduate class. Sleep a lot. Stay up late talking to your peers. Get to know the other students in the other graduate programs. Spend time in the library. Be nice to your peers, they are your people. Drink green tea.